Cook County, IL. systematically revalues all properties for taxation every three years, and 2012 is the reassessment year for Chicago. The last revaluation took place in 2009, shortly after the collapse of Lehman Brothers and the beginning of the Great Recession. The county has already sent reassessment notices to real estate owners in the northern sections of Chicago and will notify those in the rest of the city of the proposed assessed value of their properties over the next six months. The 2012 assessment will be used to determine each Chicagoan’s real estate taxes through 2014. Homeowners and business owners alike should pay close attention to this year’s revaluation. Real estate has undergone a significant value loss since 2008, and that alone makes the 2012 revaluation a defining event for Chicago’s property owners. Assessment officials strive to make the process as transparent as possible, and the notices contain a wealth of information about the property and its assessment history. At neighborhood meetings throughout the city, officials stress that the proposed 2012 assessment contained in the notice is only the first step in a process, and that every taxpayer has the opportunity to provide evidence which shows that the proposed assessment inaccurately reflects the property’s value. The assessor calculates values using mass appraisal techniques applied to data amassed on all segments of the city’s real estate markets, but recognizes that each property is unique and that market data can be made more precise by information provided by the property owner. Value loss must be considered in that context. The real estate markets—residential and commercial—were at the heart of the boom of the last decade. In the last three years real estate has, in turn, felt the full force of the burst bubble. 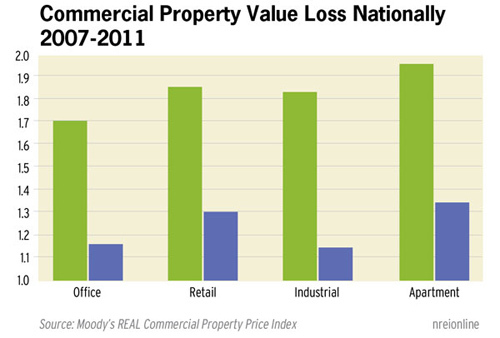 According to the Moody’s REAL Commercial Property Price Index, as of the first quarter 2011, office, industrial, apartments and retail properties had all fallen back to 2003 value levels. The other contributor to the real estate taxpayer’s bill is the aggregate budget requirement of local schools, police, fire, county, city governmental, park districts and libraries, which determines the dollars that must be collected from real estate taxes. The assessment determines the proportion of that aggregate amount the individual taxpayer owes, based on property value. Chicago’s usage classifications further obfuscate the process: Residential properties are assessed at 10 percent of value while commercial properties are assessed at 25 percent. That triggers a state equalization factor, which is included in the computation of every taxpayer’s bill. Experienced tax counsel can help taxpayers evaluate all these factors and determine whether to protest their assessment.